We must stand up to Islamic terrorism! “An audio message sent earlier to Sweden’s news agency and Secret Police (Säpo) by the suicide bomber, mentions “Sweden’s silence” over the cartoons [of Prophet Mohammed] by [artist] Lars Vilks, as well as the presence of Swedish soldiers in Afghanistan. It says the time has now come for your children, daughters and sisters to die. There is no doubt that this is another example of Islamic terrorist acts in Europe, brutally targeting defenceless citizens. We categorically condemn such terrorist crimes. We once again stress the unconditional freedom of expression and defend Lars Vilks’ right of free expression. To stand up to this terrorism we must defend the unconditional freedom of expression and the rights of women and children in communities and families labelled as Muslim. 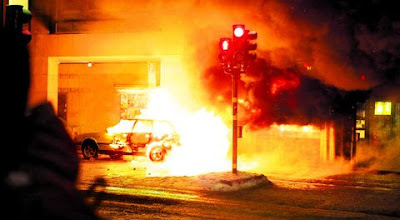 We must defend the struggle of people to smash the reactionary Islamic movement in the Middle East and support the fight for secularism in Sweden and around the world. The hands of religion and terrorism must be kept off people’s lives! In the wake of this terrorist attack, racist forces will no doubt try to target people labelled as Muslim, and will advocate further restrictions in rights of refugees. We strongly condemn such racist ploys. Islamic terrorism and racism feed off each other. We must stand up to both with the banner of humanity”.